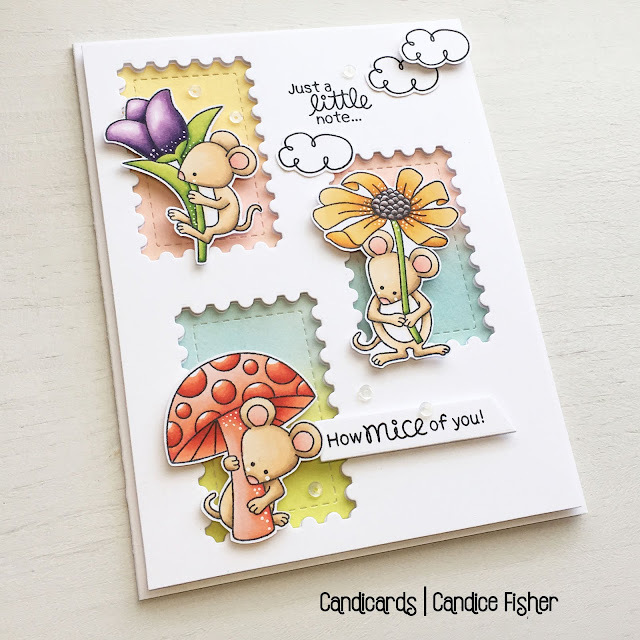 Today we have our first post from our April Guest Designer, Candice Fisher from Candi Cards! We adore Candi's gorgeous coloring and adorable scene building and we are delighted to feature her creations on our blog this month! Keep reading to find out more about her today and to check out her first project below! I am so excited to be sharing my creations with you this month of April using the amazingly adorable products from Newton's Nook Designs as a guest designer! For my first card I chose to use the soo cute Garden Mice Stamp Set, I can’t get over how adorable they are! They are also a perfect size to use by themselves or to use them all on a card. I couldn’t just pick one, so I went with a design that allowed me to use three of these cuties! I started my card by creating the front frame using the smaller stamp die from the Framework Die Set using thick white cardstock and trimming it to fit a little smaller on my card base. I then used the same smaller stamp die on watercolor paper and inked each section with oxide inks: scattered straw, tumbled glass, spun sugar, and twisted citron. I tend to use watercolor paper for my oxide ink blending, I find I get a much smoother blend. 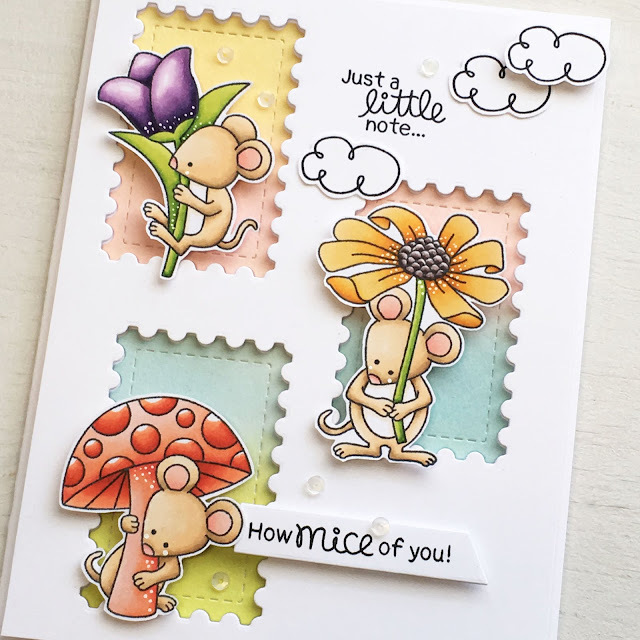 I stamped all the images from the Garden Mice Stamp Set & Newton Dreams of Paris Stamp Set , colored with copic markers, and fussy cut out, but you can get the coordinating dies to save you the time! I also stamped the sentiments, one directly on the frame (laying it all out so I knew where to place it) and one on a banner. To put it all together, I pop dotted the frame first, then I glued the inked pieces inside. Next, I pop dotted the adorable mice in each section and added a few white pen accents. The clouds I varied in height for depth and added some white sequins for a little shine! I thank you for stopping by and look forward to sharing with you throughout the month! You can also join in on the current Inky Paws Challenge for chance to win! Love the shades in the mushroom! Candice your card is amazing!!!! Awww thanks so much Silvia! I absolutely LOVE this amazing spring card! What a clever use of the dies and stunning coloring! Thank you so much Tatiana, a big compliment coming from you, a very talented lady! Thank you so much, the mice are sooo fun to color! Sneek Peek of a project at Simon Says Stamp! Sneak Peeks for April Products!